NOAA forecasters say there is a 50% chance of G1-class geomagnetic storms on Jan. 1, 2018, when a stream of solar wind expelled from a coronal hole on the Sun's atmosphere engulfs Earth's magnetic field. The solar-wind can reach speeds of 800 kilometres per second as they smash into the Earth's magnetosphere. G1-class geomagnetic storms can cause power-grid fluctuations here on Earth and can damage satellite operations in Space. They are also known to cause problems for animals who rely on the Earth's magnetic field to migrate. However, on the plus side, we will be treated to a wonderful Aurora Borealis which will be visible as far south as Michigan and Maine see below. 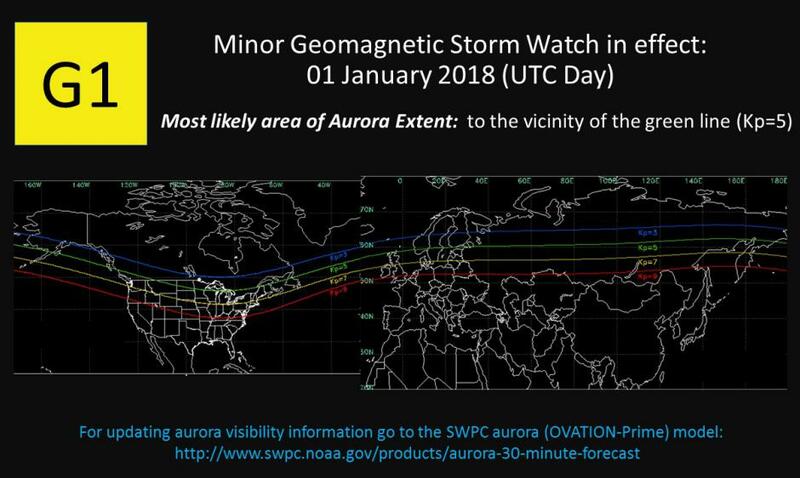 G1 (MINOR) GEOMAGNETIC STORM WATCH IN EFFECT FOR 01 JAN published: Saturday, December 30, 2017, A G1 (Minor) geomagnetic storm watch is in effect for 01 January 2018 (UTC day) due to the anticipated arrival of a recurrent, positive polarity coronal hole high-speed stream. The largest recorded geomagnetic storm in history occurred in 1859 and is called the Carrington Event. From August 28 to September 2, 1859, many sunspots appeared on the Sun. On August 29, southern auroras were observed as far north as Queensland, Australia. Just before noon on September 1, the English amateur astronomers Richard Carrington and Richard Hodgson independently made the first observations of a solar flare. 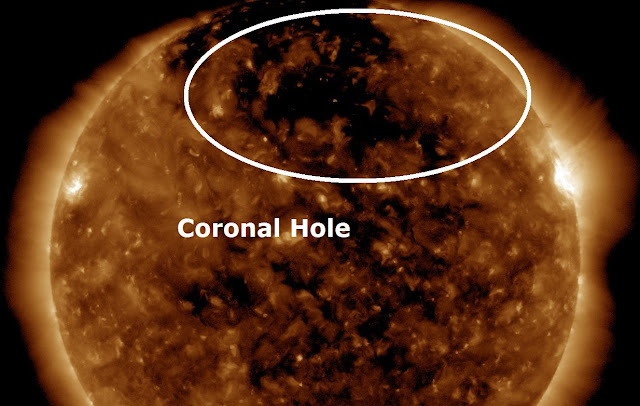 The flare was associated with a major coronal mass ejection (CME) that travelled directly toward Earth, taking 17.6 hours to make the 150 million kilometres (93 million miles) journey. It is believed that the relatively high speed of this CME (typical CMEs take several days to arrive at Earth) was made possible by a prior CME, perhaps the cause of the large aurora event on August 29, that "cleared the way" of ambient solar wind plasma for the Carrington event. According to Wikipedia, September 1–2, 1859, was one of the largest recorded geomagnetic storms (as recorded by ground-based magnetometers) occurred. Auroras were seen around the world, those in the northern hemisphere as far south as the Caribbean; those over the Rocky Mountains in the U.S. were so bright that the glow woke gold miners, who began preparing breakfast because they thought it was morning. 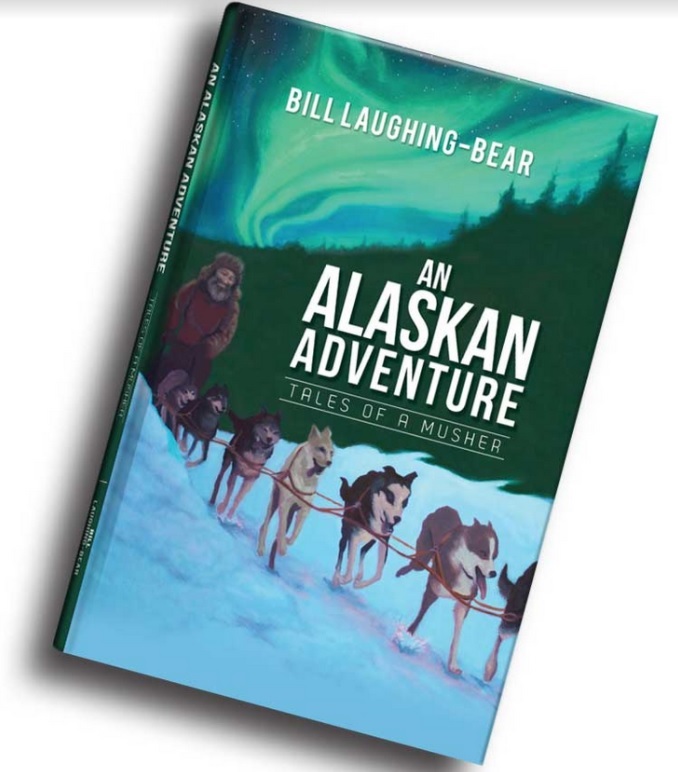 People in the northeastern United States could read a newspaper by the aurora's light. The aurora was visible as far from the poles as Sub-Saharan Africa (Senegal, Mauritania, perhaps Monrovia, Liberia), Monterrey and Tampico in Mexico, Queensland, Cuba, Hawaii, and even at lower latitudes very close to the equator, such as in Colombia.